In a society where colossal dragons and a woman in a mech suit dominate the meta landscape, it is worthwhile to appreciate an archetype on the rogue/casual scene. With the recent release of Hidden Summoners, a new archetype arrived: Prank-Kids. And they’re stirring up trouble. In its current state, the deck has an uphill battle trying to compete with the best decks of the format. Although the sample size is small, Prank-Kids have claimed a couple of top cuts at smaller tournaments. But as someone who has experimented with the deck, I think it is more fun than competitive. Whether it’s a result of the simple cartoon-style artwork or playstyle, the deck feels refreshing. It blends Link Summoning with Fusion Summoning in a way no other archetype so far has. Today, we take a look at what this mischievous archetype can offer. So far there are four revealed Main Deck monsters. They are the prank-loving kids that give the archetype its namesake. Each Prank-Kid has a different type and attribute, but their effects are quite similar. All of them tout the ability to Special Summon another Prank-Kid with a different name from your hand or deck when they are sent to the GY for a Fusion or Link Summon. First up is Prank-Kids Fansies. Fansies is a Level 1 Wind, Thunder-type monster with 0 ATK and 2000 DEF, but don’t worry about its low ATK stat. There are plenty of reasons to be a fan of this card. 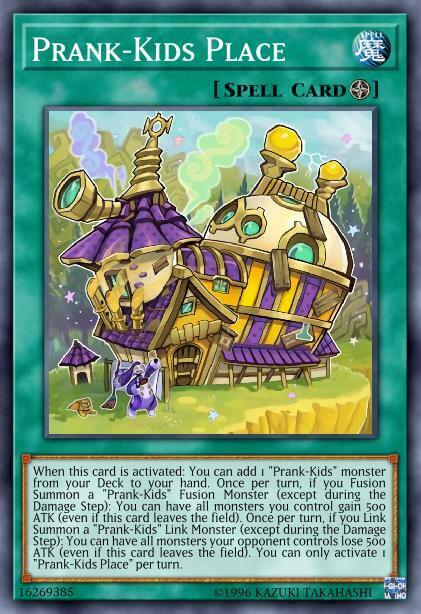 When it’s sent to the GY as Fusion or Link material for the summon of a Prank-Kids monster, you can send any other Prank-Kids card from your deck to the GY and then Special Summon a different Prank-Kid. This allows you to float and increase board presence, while also setting up your GY with, presumably, another Prank-Kid or Prank-Kids Plan. Fansies’ typing also opens up another opportunity that I will mention later. Next is Prank-Kids Dropsies. Dropsies is a Level 2 Water, Aqua-type monster with 1000 ATK and DEF. Just like the rest of the gang, when Dropsies is used for a Prank-Kids Link/Fusion monster, you can Special Summon a different kid. Instead of dumping a card from the deck in the process, you can gain 1000 Life Points. Additional Life Points are always nice, but the real benefit of this card is that you can continue to float into new monsters. One might say that its combination of level and typing are totally awesome. Then we have Prank-Kids Lampsies. Lampsies is a Level 3 Fire, Pyro-type monster with 1500 ATK and 500 DEF. The extra ATK is nice, but yet again its effect is what matters most. When it floats, this kid deals 500 burn damage. Fitting, considering its type and attribute. Finally we have Prank-Kids Rocksies. 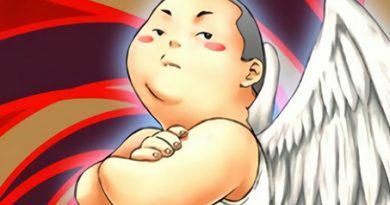 This kid has yet to join the family in the TCG, but it will soon as one of the Soul Fusion: Special Edition promos. Rocksies is a Level 4 Earth, Rock-type monster with 1500 ATK and DEF. It has the same ability to Special Summon from the deck, but its effect also allows you to banish one card from your hand to draw a new one. This additional clause is better than adding or subtracting Life Points, making Rocksies a welcome addition. As of now, all of these monsters should be played at 3. Their ability to float means you’ll be running through at least one copy of each Prank-Kid in a turn (assuming you’re uninhibited by your opponent’s disruption). 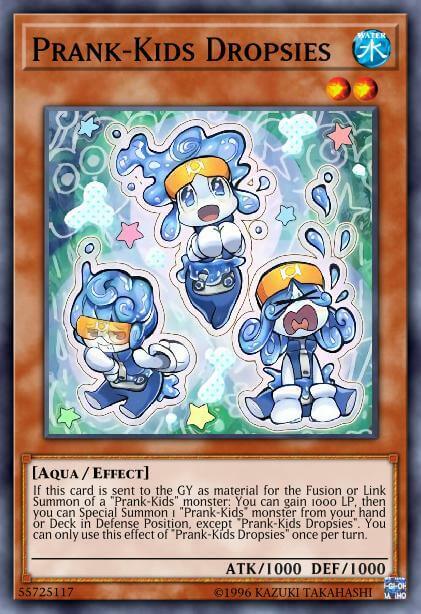 Overall, these monsters facilitate exactly what the deck is meant to do: float so that you can summon your Prank-Kids Link/Fusion monsters. It is worth mentioning that, to keep the deck fair, all of their effects contain hard “Once per turn” clauses. Now we move on to the Prank-Kids spells. And there’s no better card to start with than the place the Prank-Kids call home. Like with so many archetypes that have come out in the past few years, most good decks need a good Field Spell. Or, at least, it’s a huge plus to have one. Prank-Kids Place fits the bill. Upon activation, you can search for any Prank-Kids monster. If the effect ended there, it would still be a good card. But, because this archetype is all about shenanigans, it also includes some ATK manipulation. Once per turn, if you Fusion Summon a Prank-Kid, you can increase all of your monsters’ ATK by 500. 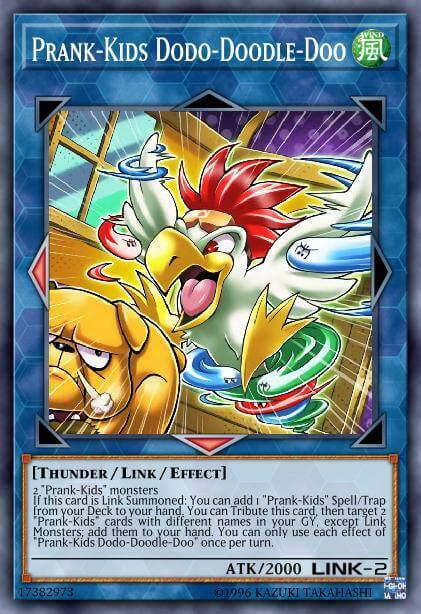 And if you Link Summon a Prank-Kid, you can decrease all of your opponent’s monsters’ ATK by 500. Although this is cute, it can help you deal with bigger monsters and push for game. Of course, what would the archetype be without its supply of pranks? That’s where their Continuous Spell card Prank-Kids Pranks comes in. Once per turn, by discarding a Prank-Kids card, you summon a Prank-Kids token, which can be used as material. This is especially important since they currently lack a Link 1 monster. During the End Phase, you also can shuffle back three other Prank-Kids cards from your GY to draw a card. This makes sure that you won’t run out of Prank-Kids to float into. Last but not least for the spells we have Prank-Kids Pandemonium. There’s not too much to say about this card. It’s basically an in-theme Polymerization with the restrictions that you can only activate it during the Main Phase and you can only Normal or Special Summon Prank-Kids after you activate it. However, it is also a Quick-Play Spell, which means these restrictions aren’t too bad since you can Fusion Summon during your opponent’s turn. None of these Spell cards are broken, but each performs an important role for the deck to operate. Prank-Kids are not a Trap-heavy deck by any means. Following that logic, only one Continuous Trap card has been released thus far: Prank-Kids Plan. Plan combines elements of the effects of Pranks and Pandemonium. During either player’s Main Phase, you can Link Summon a Prank-Kid using Prank-Kid monsters you control. Like Pandemonium, this allows you to play on your opponent’s turn, which has been an important ability for many recently competitive decks. It also has a GY effect. When your opponent attacks, you can banish it to shuffle any number of Prank-Kids cards in your GY back to the deck and decrease the attacking monster’s ATK by 100 for each card shuffled back. The ATK decrease is probably not that significant in most cases, but like with Pranks, you do get to replenish your resources. Its combination of effects makes Plan a solid card, but you probably don’t want to run more than two copies as it can clog your hand. We’ve looked at the Main Deck, but now let’s dive into the Extra Deck. This is where the true power of the archetype lies, as the whole premise of the Main Deck is to get out your Links and Fusions. Currently there are three Link monsters and three Fusion monsters. 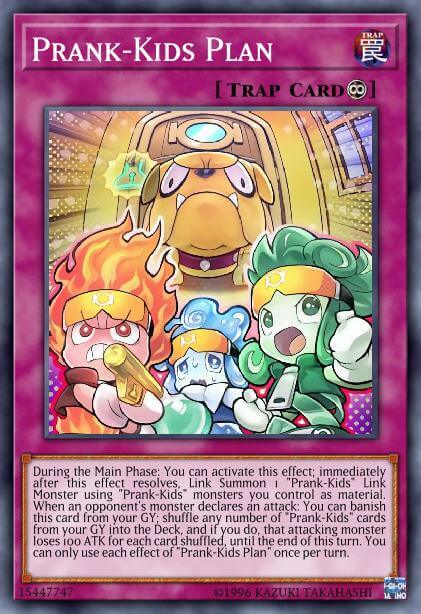 Each Link and Fusion monster corresponds to one of the Main Deck Prank-Kids, sharing the same type and attribute. Corresponding with Fansies, we have Prank-Kids Dodo-Doodle-Doo and Prank-Kids Battle Butler. Contrary to its name, Doodle, a Link 2, is no laughing matter. Upon Link Summon, Doodle searches whatever Prank-Kid Spell or Trap card you need. In addition, you can Tribute it to add two Prank-Kid cards in your GY back to your hand. It’s a searcher and recycler all in one, so you should run at least two copies. 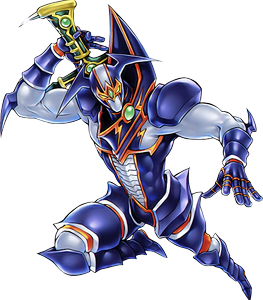 Battle Butler offers a different approach, being a Level 10 Fusion with 3000 ATK and DEF that provides a lot more power than most of the other monsters in the archetype. It must be Fusion Summoned using Lampsies, Dropsies, and Fansies as material. When Battle Butler is sent to the GY by an opponent’s card, you can Special Summon any non-Fusion monster from your GY. A noticeable omission is that the monster doesn’t have to be a Prank-Kid, but most of the time you’ll be summoning Battle Butler for its other effect. You can Tribute it during either player’s turn to destroy all monsters your opponent controls. This can completely shut down your opponent’s turn, especially if they were unaware you had Pandemonium Set to Fusion Summon on their turn. The next duo corresponds to Dropsies: Prank-Kids Weather Washer and Prank-Kids Rip-Roarin-Roaster. Washer is a Level 5 Fusion that requires any two Prank-Kids to summon. Its first effect prevents your opponent from activating effects when one of your Prank-Kids attacks. This can help secure victory, but battle-related Trap cards are uncommon nowadays. Its second effect lets you Tribute it to Special Summon two non-Fusion Prank-Kids from your GY. The downside is you can only do this on your opponent’s side and thus it’s not an extender on your turn. The upside is that those monsters cannot be destroyed by battle, hopefully surviving until your turn. However, Washer’s downside makes running more than one copy somewhat unnecessary. Roaster is very similar to Battle Butler. When it leaves the field due to your opponent, you can add any card from your GY back to your hand, except a Link monster. And instead of destroying monsters, Roaster destroys all of your opponent’s Spells and Traps when you Tribute it, which can be devastating against backrow-heavy decks. The last pair corresponds to Lampsies: Prank-Kids Bow-Wow-Bark and Prank-Kids Rocket Ride. Bark is similar yet inferior to Doodle as a Link 2. Instead of getting a search, it boosts the ATK of a Prank-Kid it points to by 1000. It also can add back two Prank-Kids cards from your GY, but this only works during your opponent’s turn. Fortunately it does get the Weather Washer treatment. When you use this effect, your opponent cannot destroy your Prank-Kids with card effects. 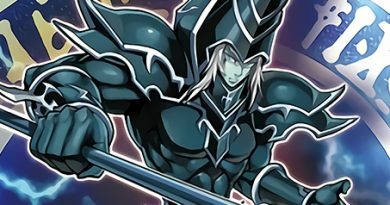 Unlike with Fansies and Dropsies, Lampsies does not have a corresponding Extra Deck monster with 3000 ATK. But Rocket makes up for it by serving as the best extender of the deck. Like Weather Washer, you can Tribute it to Special Summon two Prank-Kids. However, you can do this on your turn, serving as an Infernity Launcher for the deck. This is extremely important for setting up your board while also triggering the effects of the Main Deck Prank-Kids. Its other effect lets you cut its ATK so it can attack directly, which doesn’t usually come up unless you’re trying to close out a game. As you can see, there are a lot of similar effects with slight variations that allow you to go into the Extra Deck for whatever the situation calls for. And they make playing during your turn and your opponent’s turn possible. Although the in-theme synergy is apparent, there are non-Prank-Kids cards that can possibly improve the deck. One such card that every build should play is Instant Fusion. You can summon both Weather Washer and Rocket Ride with Instant Fusion. This can provide an extra Prank-Kid monster for a Link Summon. 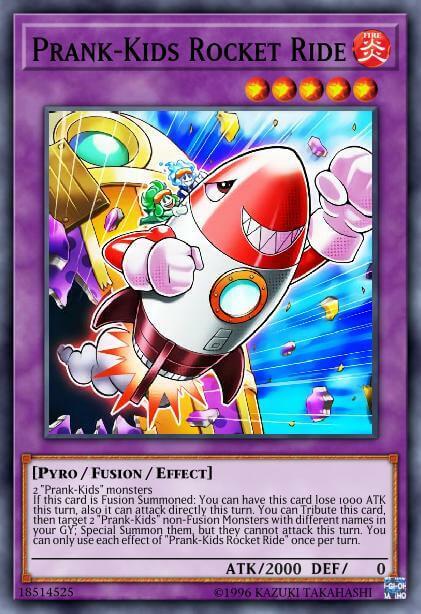 Or, if opting for Rocket, you can use its effect to Special Summon two for the price of one. That’s not the only available option. 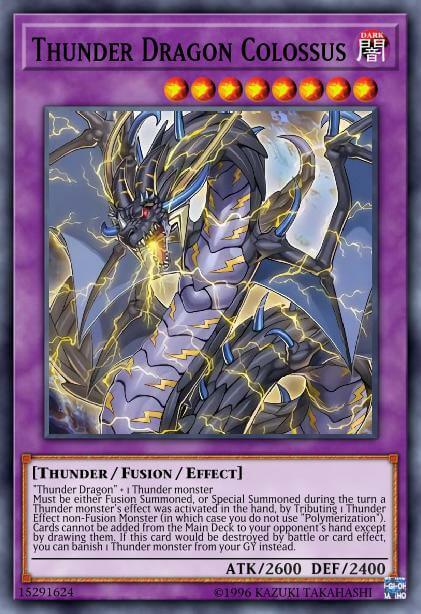 Due to Fansies being a Thunder-type, the deck can actually summon Thunder Dragon Colossus, cutting off your opponent from searching. Unfortunately, this does mean using space for a small Thunder Dragon package and making the deck less budget-friendly. But if you like big floodgate monsters that protect themselves and can shut down Sky Strikers, it’s definitely worth exploring. Also, as I not so subtly mentioned, Dropsies is a Level 2 Aqua monster. That means that two copies of Dropsies make it possible to summon Toadally Awesome, giving you a negation that Prank-Kids lack. These are just suggestions though, the deck can function well without Colossus or Toad. After playtesting, it is clear that this deck is a ton of fun once it gets going. 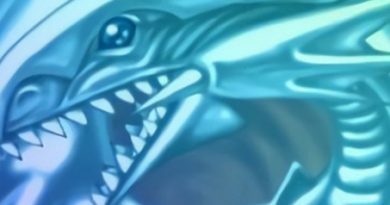 However, the deck is unlikely to achieve much success beyond locals or the occasional regional with the current card pool. The decks currently at the top are simply more powerful and have less trouble playing through disruption. That doesn’t mean the archetype isn’t worth investing in, however. There’s a possibility the archetype could get more Extra Deck support. So far there has been a Link and a Fusion released matching the type and attribute of each Main Deck monster, except Rocksies. I would be surprised if we didn’t get an Earth, Rock-type Link and Fusion in the future, but until there’s an official announcement this is merely an assumption. Regardless, if you’re looking for a new deck with an interesting playstyle that doesn’t break the bank, Prank-Kids may be the deck for you.